The railway bridge over the Teesta at Sevoke was reopened for traffic last night following a decrease in the water level of the river, but trains are allowed to pass at a restricted speed of 10km per hour. The Northeast Frontier Railway cancelled the traffic through the Sevoke bridge yesterday morning as the Teesta was rising because of heavy rains in Sikkim. A few long-distance trains were diverted and 10 locals cancelled yesterday. 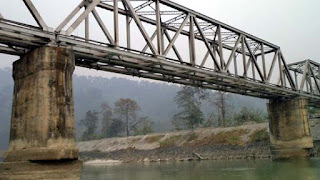 "Due to decrease in water level in Teesta river, divisional officials have allowed train movement over the bridge No. 52 between Bagracot and Sevoke at a restricted speed of 10 kmph. All the trains originally plying through the route have started running and all diversions have been cancelled. Restoration of normal speed will be subject to further recession of water level in the river," said a statement by the NFR. NFR officials in New Jalpaiguri said around 11pm yesterday, they had got reports that the water level had receded to some level near the bridge. "A goods train passed through the route first at a restricted speed. There was no long-distance passenger train through the Dooars route last night and local trains had been cancelled. This morning, both local and long-distance trains started moving," an NFR official said.